I had the hardest time deciding if I was going to send my kids to school today! I didn't want to send them to the Valentine party. This is the reason--Turner has 6 different classes at school. There are a total of 50 kids in his program. They asked the kids to bring 20 Valentines. Most kids will be fine, but Turner has had some issues with feeling included at school. He is an intense kid and struggles when things aren't a certain way...I actually have a whole other post on this subject waiting to be written. But the point is, I sent him hoping, and praying that his box won't be left empty today. These were the cute valentines I made for my boys. I taped a fun size Snickers or Almond Joy on the appropriate box. I think they turned out cute! Feel free to use! Print, cut out, and tape a fun sized Snickers or Almond Joy in the box. Your kids can address and sign them! Those are really cute! 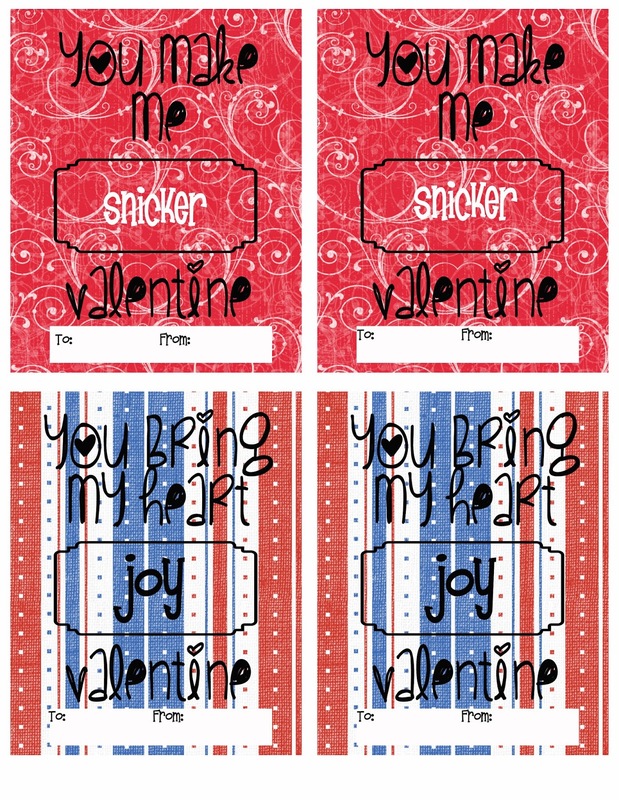 I'll have to use them next year, and maybe for this year for a few friends (already have the valentines for class). Cute! I hope he got some nice Valentines.